The multi-domain, tetrameric p53 protein was discovered in 19791-3, first mistakenly described as an oncogene, before its true function as a powerful tumor suppressor was realized4,5. p53 consists of two N-terminal transactivation domains (TAD1 and TAD2), a proline-rich domain (P-rich), a sequence-specific DNA binding domain (DBD), a linker domain, tetramerization domain (TD), and a lysine-rich, basic C-terminal regulatory (REG) domain5 (Fig. 1). As a transcription factor, p53 can regulate the expression of up to 3000 genes involved in apoptosis, senescence, cell cycle arrest, DNA repair, apoptosis, tumor microenvironment, autophagy, and invasion/metastasis6-8. 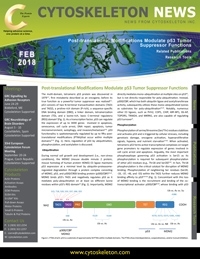 p53 functionality is spatiotemporally regulated by up to fifty post-translational modifications (PTMs)that occur within multiple domains9-12 (Fig. 1). Here, regulation of p53 by ubiquitination, phosphorylation, and acetylation is discussed.